To hell with celebrity chefs; enough already with no-bookings policies; and, if it pleases you, foam and soil can go get something that rhymes with ‘ducked’ and ends in childbirth. What Melbourne needs isn’t a return to its multicultural roots but a simple exploration of the ones that already exist. 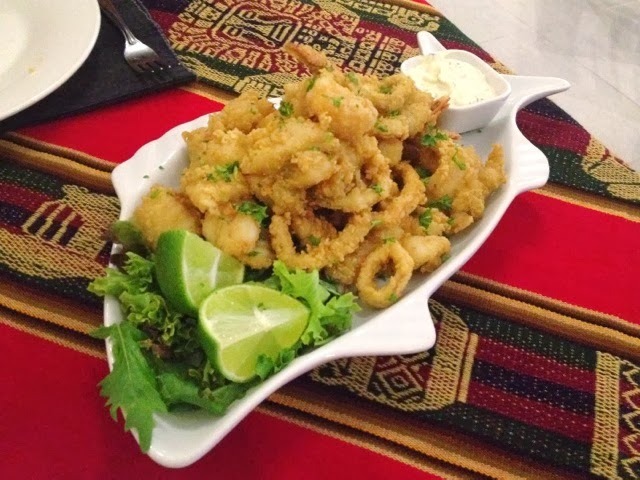 What Melbourne needs are more restaurants like Mi Peru D’Carmen in Parkdale, a little Peruvian restaurant with a whole lot of heart. I popped in with the mister for a late dinner after reading about Mi Peru in Good Food. We had just attended the launch of another restaurant in the area, but the finger food wasn't cutting it. I don't get over to Parkdale too often, but now that we've eaten here, we'd happily drive the 45 minutes from home to return. 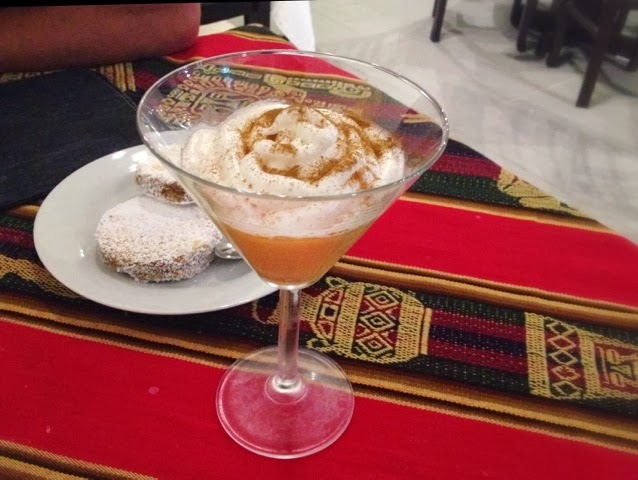 If my aim was to sell the restaurant to you, my first sentence would be, “don’t judge a book by its cover.” You’d probably lift your nose in the air at the bare walls, plastic-covered white leather seats and tables layered with red Peruvian cloths, but I wouldn’t care – there would simply be more for me. 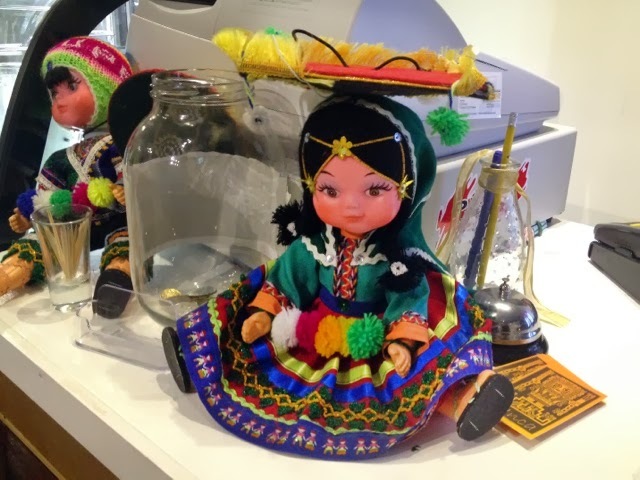 There’s not much to Mi Peru aside from framed artworks barely connected by a Peruvian theme and a couple of traditional dolls that stare blankly from the counter, Chuckie-style. The warmth comes courtesy of the food and service. We were privileged to be waited upon by a gentleman who smiled with his entire being. “I think I’m actually in love with him,” said my boyfriend. We had to restrain ourselves from embracing said waiter every time he came to the table; he was still the topic of conversation a week later. He handed us menus in plastic slips, apologising unnecessarily as we tried to figure out if he had this effect on everyone or if we were just unusually hungry. The mystery remains unsolved. Next time we dine here I’ll try something more meaty. We limited ourselves to fish due to dietary requirements (not mine, obviously). 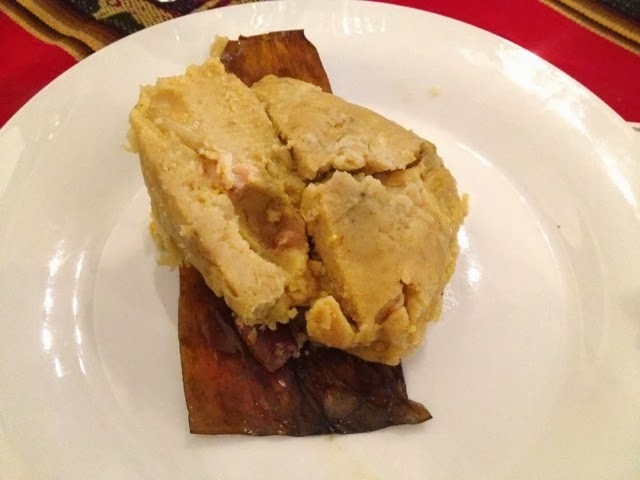 I still managed to sneak a chicken tamal in there, a doughy chunk of white maze interspersed with spiced chicken, wrapped in banana leaf package with red onion on the side. 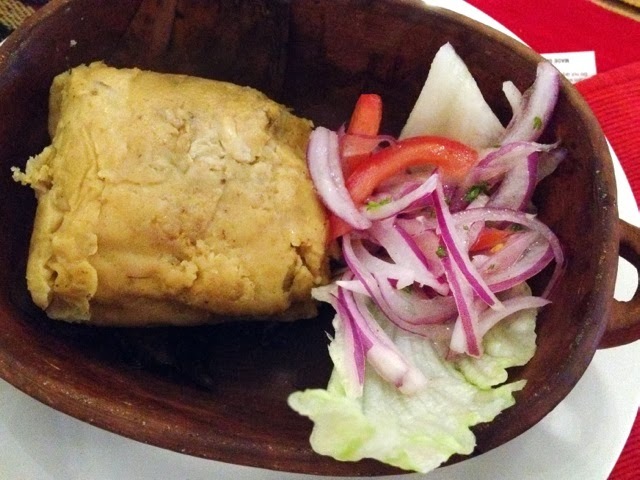 If our waiter’s personality had a taste, it would be the tamal – comforting, moreish and unassuming. Even the pescatarian was breaking off bits without chicken and popping them into his mouth with abandon. Our purple corn drink, chicha morada, arrived long after the tamal had been demolished. We didn’t mind, You can’t get mad (let alone stay mad) when your waiter has a face like that. The chica morada tasted like earthy Hubba Bubba grape bubblegum. Not everyone’s cup of corn, but an interesting experience worth trying. Main dishes at Mi Peru are meaty, fragrant and simple in a street food kind of way. Lamb stew comes in coriander sauce and hunks of pork and chicken in an Andean, dried potato sauce with crushed peanuts. Carbs feature in most mains: potato, fries or rice. 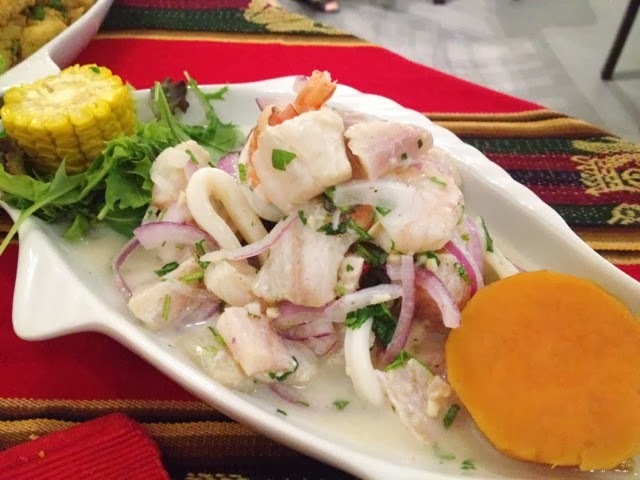 We opted for the ceviche mixto and jale de mariscos (seafood basket). They turned out to be similar dishes prepared differently, both with soft snapper, plump prawns, calamari and scallops. The uber-tart ceviche was scattered with chilli and coriander and made our salivary glands work overtime. Super addictive. The seafood in the basket, which was actually a fish-shaped platter, came covered in a light and crunchy batter – so fresh we doused it in lime juice and pushed the mayo-based sauce aside. Sweets are traditional too. 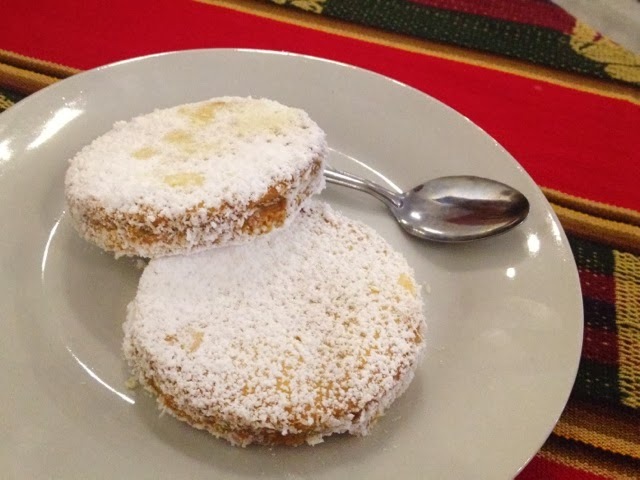 The suspiro a la limena made the dry, stale alfajores – the only disappointing dish – irrelevant. Thick vanilla bean custard so dense it passed as pudding arrived from the refrigerated cabinet, topped with a mountain of fluffy sugared egg whites, lashings of caramel and a dusting of cinnamon. I was forced to swallow my comments about pre-prepared desserts and battle the urge to order a second. Mi Peru D’Carmen serves Peruvian soul food. If it tastes like somebody’s gran is out the back whipping it all up, that’s because they are: Carmen has eight grandchildren and is up at 6am each morning to prepare. If you’re after a fancy dinner, you’re better off elsewhere. But if you’re the kind of person who loves a hearty feed, staff that unintentionally draw you in and food that could be straight out of someone’s home kitchen, I’ll be seeing you at Mi Peru soon. what is the orange ball, might I ask? Hi Sally, if it's what I think you're referring to, it's a slice of butternut squash.